The cake flavor was lemon with a butter cream icing as filling all covered and decorated using marshmallow fondant and topped with a vale. 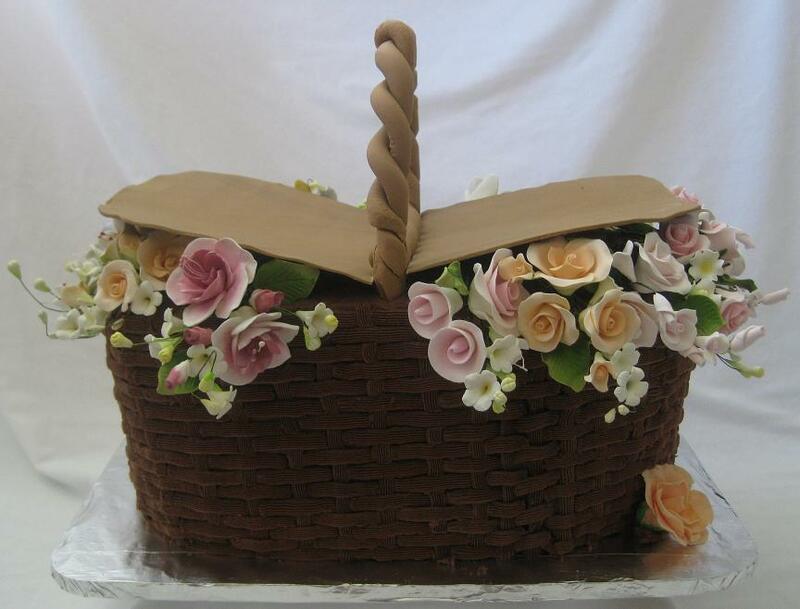 Rhonda B. from Cary ordered this bridal shower cake basket. 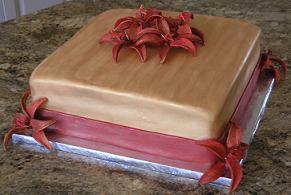 Flavored white with chocolate mousse filling covered with hand made chocolate buttercream icing. E-mail Steph about bridal shower cakes. 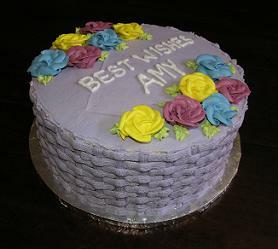 One of my frequent cake clients ordered this basket weave cake for her friends’ bridal shower. The basket cake was covered with hand made butter cream icing and highlighted with butter cream roses, yummy! The charm cake was made special for Nikki’s bridal shower. Charm cakes are more of a southern tradition and it works like this. After baking the cake and decorating it you place charms hanging from ribbon into the cake, before cutting the cake each bridesmaid is to pull out a charm (not knowing what it will be) and what the charm is will tell you your fortune! The cake flavor was vanilla with buttercream & strawberry filling covered and decorated with hand made marshmallow fondant. This pink cake accented with candy melt high heel shoes was yellow cake flavor with buttercream filling covered with marshmallow fondant. 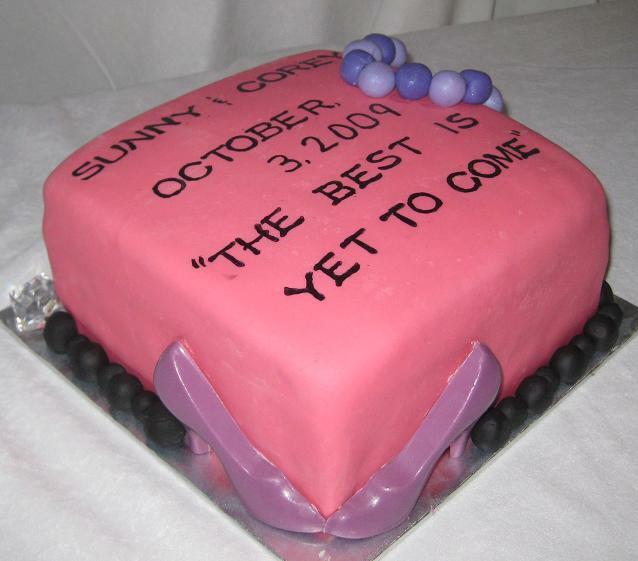 The bridal shower tradition is mostly practiced in US and Canada. Usually coordinated by the bridesmaids to offer gifts for the soon to be bride and groom. Kristin K. from Chapel Hill ordered this box cake for her friends’ bridal shower. 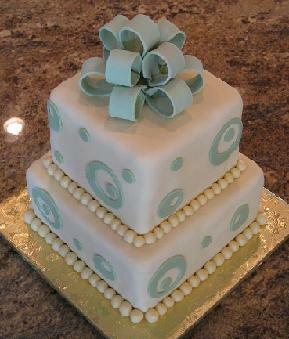 This bridal shower cake flavor was vanilla with buttercream icing covered with hand made marshmallow fondant. 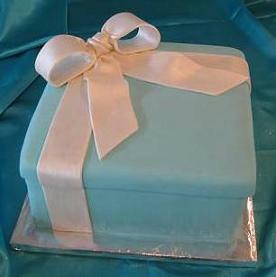 The box shaped cake was topped with a hand made white fondant bow. 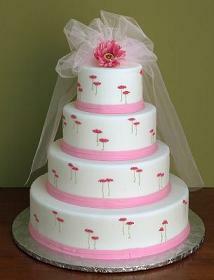 Sally K. ordered this square cake with red stargazer lilies for a coworker’s bridal shower in Raleigh, NC. The cake flavor was vanilla with butter cream and strawberry filling covered with marshmallow fondant. Let us make you a bridal shower cake that will bring a smile and celebrate love with sweet confection. 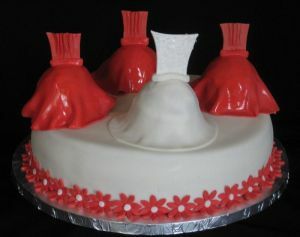 Aimee T. from Cary, NC ordered this shower cake with a fondant bow topper. The cake flavor was white cake with a delicious lemon curd filling. 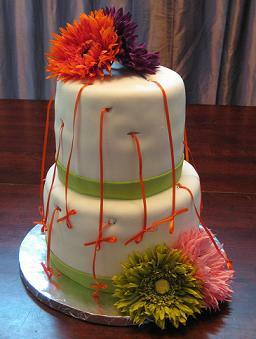 The circles and fondant bow was made out of marshmallow fondant. This bridal shower cakes flavor was lemon butter cream with raspberry filling. Yummy!